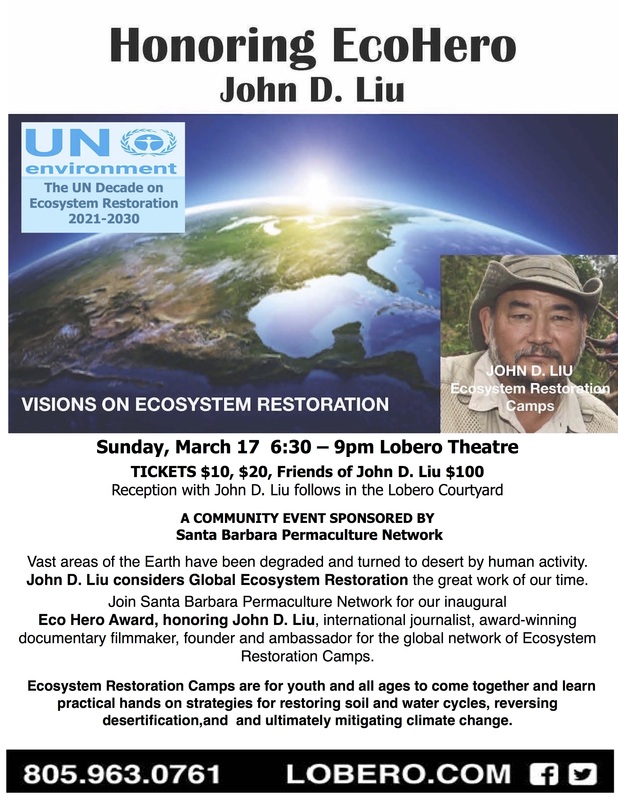 Join Santa Barbara Permaculture Network on Sunday, March 17, at the Lobero Theater, for the first annual Eco Hero Award, honoring John D. Liu, international journalist, award-winning documentary filmmaker, soil scientist, founder and ambassador for the global network of Ecosystem Restoration Camps. Vast areas of the Earth have been degraded and turned to desert by human activity over the millennia, causing drought, poverty, and releasing carbon into the atmosphere. The U.N. currently estimates the Earth has almost 5 billion acres of deforested and degraded ecosystems, an area larger than the South American continent. John D. Liu considers Global Ecosystem Restoration the great work of our time. As a young Chinese American, John D. Liu’s early career started as a cameraman and journalist covering major geopolitical events. In 1995 he got an assignment to film the Loess Plateau, one of the driest and poorest regions in China, where the Chinese government and the local people of the region transformed a massive degraded area the size of Belgium into a verdant and productive green oasis. Stunned by what he saw and with the realization this ecosystem restoration model could be replicated around the world, Liu was inspired to become a soil scientist, and spent the next 20 years visiting more than 80 countries documenting similar large scale ecosystem restoration projects, eventually creating the award winning What if We Change, and Hope in a Changing Climate film series. Broadcast on CBS, BBC, National Geographic and other outlets, these film series cover successful ecosystem restoration projects in Portugal, Jordan, China, Ethiopia, Sweden, Rwanda, Spain, Mongolia, Uganda, Australia and more. Bringing this restoration vision into the 21st century, Liu and others launched the Ecosystem Restoration Camp movement, and currently serves as Ambassador for the global Ecosystem Restoration Camp network. The Ecosystem Restoration camps are for youth and all ages to come together and learn practical hands on skills and effective strategies for restoring soil and water cycles, reversing desertification, and ultimately mitigating climate change. Camp Altiplano, the first ecosystem restoration camp, located in an emerging desert in Spain, celebrated its first anniversary last summer. Other camps are in the works, including a camp in San Miguel de Allende, Mexico, and a developing site in Paradise, California, where devasting wildfires took place last Fall. 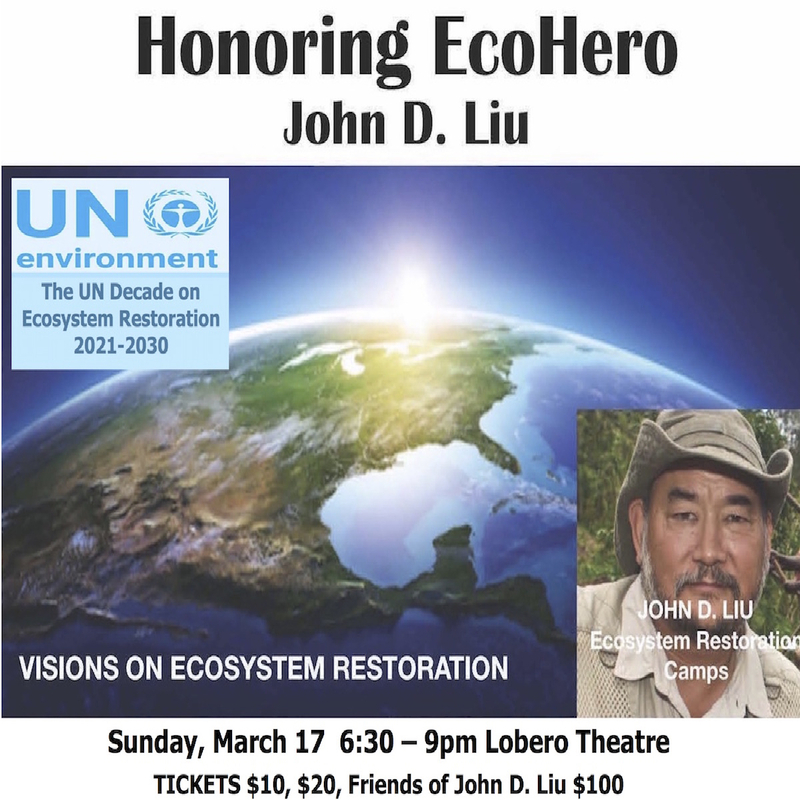 After the Eco Hero award is presented, John D. Liu will share personal stories about his experiences over the decades, and update the audience about the developing Ecosystem Restoration camps and how others might get involved. A reception follows the event in the Lobero Courtyard, where all are welcome to meet and converse with John D. Liu. Founder of the Environmental Education Media Project (EEMP), Senior Research Fellow with the International Union for Conservation of Nature (IUCN): Visiting Fellow with the Critical Zone Hydrology Group; Faculty of Earth and Life Sciences at the Vrije University Amsterdam. Chairman of the Advisory Board for the Ecosystem Camps Foundation, and currently serves as Ecosystem Ambassador for the Commonland Foundation.